Do you remember when you became a regular Internet user? Me neither. There was a time when I never used the Internet and, these days, it would be next to impossible to do my job without it. But I'm hard pressed to pinpoint the exact time frame when I stopped being an occasional user and became a regular one. Technological advances are often like that. Somebody comes up with a great innovation, and it takes years before it makes its way into common use. In this month's feature story, Beth W. Orenstein looks at the use of and advancements in radioembolization for liver cancer. 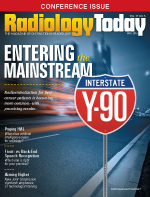 As Orenstein reports, over the past decade, interventional radiologists have been refining their techniques and patient selection protocols to the point where radioembolization outcomes are as good or better than more established treatments. The procedure can also be done in less time than standard treatments, with fewer side effects and without a hospital stay. That's good news because, although mortality rates from most cancers are in decline, mortality from liver cancer has been on the rise for years, and we need more tools to fight it. Speaking of technological advances, don't miss Elizabeth S. Roop's comparison of front- and back-end speech recognition systems. Speech recognition has come a long way, and hospitals are adopting it at a prolific rate, but front- and back-end each have highly specific advantages and disadvantages. Those differences can significantly affect workflow, productivity, and allocation of funds, with implications for doctors, transcriptionists, and patients. The new Joint Commission requirements for CT technologists are another important concern for radiology groups. The goal of the new requirements is to "better capture risks in diagnostic imaging." For this reason, technologists who perform diagnostic CT scans will need to have advanced-level certification from the American Registry of Radiologic Technologists or the Nuclear Medicine Technology Certification Board on September 1 of this year. Although some exceptions may be made for previous training, state licenses, or certifications, all CT technologists must obtain the new accreditation by 2018. As Colin Snyder reports, the new rules are likely to affect the technologist job market. Also in this issue, we look at the myth and reality of AI. I'm not referring to the AI who was recently inducted into the Basketball Hall of Fame, I'm talkin' 'bout artificial intelligence. Although there have been rumblings that AI may eventually supplant living, breathing radiologists, that scenario seems highly unlikely. AI is, however, making its way into tools that may assist radiologists in the near future and beyond. Rather than taking the place of radiologists, AI is poised to help them be more accurate and efficient. It's even possible that somewhere down the road, someone will ask: Do you remember when you became a regular AI user?